Asthma is a chronic respiratory condition, with airway hyperresponsiveness (AHR) and inflammation as hallmarks. The hypothesis that the substantially increased expression of arginase 1 in activated macrophages limits the availability of L-arginine for nitric oxide synthesis, and thus increases AHR in lungs of mice with experimentally induced allergic asthma was recently refuted by several studies. In the present study, we tested the hypothesis that, instead, a low circulating concentration of arginine aggravates AHR in the same murine asthma model. Female FVB F/A2 tg/tg transgenic mice, which overexpress rat arginase 1 in their enterocytes, exhibit a ~ 50% decrease of their plasma L-arginine concentration. Adult female F/A2 tg/tg mice and their wild-type littermates (F/A2 wt/wt ) were sensitized and challenged with ovalbumin (OVA/OVA). Lung function was assessed with the flexiVent™ system. Adaptive changes in the expression of arginine-metabolizing or -transporting enzymes, chemokines and cytokines, and lung histology were quantified with qPCR, ELISA, and immunohistochemistry, respectively. Reduction of circulating L-arginine concentration significantly increased AHR in OVA/OVA-treated mice and, to a lesser extent, even in PBS/OVA-treated mice. The pulmonary inflammatory response in OVA/OVA-treated F/A2 tg/tg and F/A2 wt/wt mice was comparable. OVA/OVA-treated F/A2 tg/tg mice differed from similarly treated female mice, in which arginase 1 expression in lung macrophages was eliminated, by a complete absence of an adaptive increase in the expression of arginine-metabolizing or –transporting enzymes. A reduction of the circulating L-arginine concentration rather than the macrophage-mediated increase of arginine catabolism worsens AHR. Allergic asthma is a chronic respiratory condition characterized by TH2-predominant airway inflammation, increased mucus production, mucosal edema, airway hyperresponsiveness (AHR) and airway remodeling. Expression of the enzyme arginase is increased in asthmatic lungs. It has been suggested that increased arginase expression affects AHR by reducing L-arginine availability for nitric oxide synthases (NOS), thereby limiting the production of nitric oxide (NO) [1, 2]. However, the relation appears to be complex. The contribution of the individual NOS enzymes to bronchodilation or AHR is difficult to determine since all three NOS isoforms are expressed in the lung and control each other’s expression and activity . Furthermore, L-arginine availability is not directly related to exhaled NO or inflammatory parameters in asthma, and is related to AHR only in severe asthma . Intracellular L-arginine availability depends on its consumption by NO synthases and arginases, and its uptake into the cell through transporters, such as cationic (CATs) and heterodimeric amino-acid transporters (e.g. LAT1 and − 2), and on recycling of L-citrulline (the other product of NOS activity) to L-arginine. CAT-mediated uptake of arginine is inhibited by other cationic amino acids, such as L-ornithine (a product of arginase activity) and lysine, but also by polycations, such as major basic protein (MBP; ), which is released by infiltrating eosinophils during the asthmatic response. The effects of elimination of NOS isoforms [6–10] or arginase 1 [11, 12] on lung function and inflammation in mouse models of allergic asthma have been extensively investigated. In these animal models, NOS2 , arginase 1 [11, 13] and, to a lesser extent, arginase 2  are strongly upregulated. The more predominant arginase form, arginase 1, is found in macrophages within the inflammatory infiltrates in the asthmatic lung . The potential competition of arginase and NOS for their common substrate arginine explains the interest in the behavior of both enzymes. Although NO synthases have a ~ 250-fold higher affinity for L-arginine than arginases, arginases have a ~ 1000-fold higher Vmax than the NO synthases, which makes regional depletion of arginine  and uncoupling of NOS  a realistic possibility. Although arginase 1 elimination in macrophages had major effects on the gene-expression profile of pulmonary macrophages, the effects on lung function were absent in both BALB/c and C57BL/6 mice [12, 17, 18], or limited to the peripheral airways in male C57BL/6 mice . We, therefore, hypothesized that macrophages were less important for the regulation of local arginine availability in the airways than anticipated and that, instead, the circulating concentration of arginine played the more important role in supplying arginine for NO synthesis and relaxation of airway smooth muscles. To test this hypothesis, we studied mice in which the circulating L-arginine concentration was decreased to ~ 45% of control mice due to overexpression of arginase 1 in the enterocytes of their intestines  and sensitized and exposed them to ovalbumin to induce an asthmatic phenotype. F/A2 transgenic mice on a FVB background, which overexpress rat arginase 1 in their enterocytes , were bred hemizygously (F/A2 wt/tg ). We studied female homozygous (F/A2 tg/tg ) mice and used their female wild-type (F/A2 wt/wt ) littermates as controls. All mice were approximately 10 weeks at the start of the experiments. The study was reviewed and approved by the committee for animal care and use of Maastricht University (DEC2005–146). Mice were injected intraperitoneally on days 0 and 14 with 10 μg ovalbumin (OVA), grade V (Sigma-Aldrich, Zwijndrecht, The Netherlands) in a total volume of 100 μL PBS, containing 1 mg/mL of AlOH3 (alum) as adjuvant (Imject Alum®, Thermo Scientific, Rockford, IL, USA). To ensure an adequate induction of gene expression in the sensitized and challenged mice, we performed a time-course study. Additional file 1: Figure S1 shows that daily exposure to 1% OVA for 30 min strongly increased Arg1, Nos2, and Cd68 expression after 6 days of treatment. Mice were, therefore, exposed on days 21–27 to daily aerosol challenges with 1% (w/v) OVA in PBS for 30 min in custom-made inhalation chambers. Lung function was assessed 12 h after the last challenge. The protocol was described previously . In brief, female mice were injected intraperitoneally with 80 mg/kg sodium pentobarbital to induce anesthesia, followed by 40 mg/kg after 30 min for anesthesia maintenance. An 18-gauge blunt needle was inserted into the trachea and connected to a mechanical small-animal ventilator (flexiVent™, Scireq, Montreal, Canada). The mice were ventilated at 200 breaths/min with a delivered tidal volume of 0.25 mL against a positive end expiratory pressure (PEEP) of 3 cm H2O applied by a water trap. Aerosolized methacholine (Sigma, Steinheim, Germany) challenges were performed by delivering successively 0, 3.1, 12.5 and 50.0 mg/mL methacholine in PBS. Following each aerosol challenge, ventilation was interrupted every 10 s to allow for a 1-s passive expiration followed by a 2-s broad-band (1–19.6 Hz) volume perturbation. The peak-to-peak excursion of the ventilator piston during delivery of these perturbations was 0.17 mL, resulting in a delivery of ~ 0.14 mL after correcting for gas compression in the ventilator cylinder and connecting tubing. Pressure and flow were recorded during application of the perturbations and used to calculate the input impedance (Zrs) of the respiratory system. Zrs was then fitted to the uniformly ventilated model of the lung with constant-phase tissue impedance [20, 21]. On day 27, after completing the Flexivent analysis, blood was collected from the inferior caval vein in heparin-coated tubes, centrifuged for 3 min at 5000*g, snap frozen in liquid nitrogen and stored at − 80 °C. Plasma OVA-specific IgE levels were determined by ELISA (Product #: M036005, MD Biosciences, Zürich, Switzerland). For the determination of plasma amino acids, 50 μL of plasma was added to 4 mg sulfosalicylic acid, vortexed, snap-frozen in liquid nitrogen and stored at − 80 °C until use. Plasma amino acid concentrations were measured using a fully automated HPLC system . Immediately following euthanasia, lungs were isolated. The left lung was filled with 4% formaldehyde (Klinipath, Deventer, the Netherlands) for 10 min at a pressure of 20 cm H2O and submersed for 24 h in 4% formaldehyde at room temperature (RT) prior to paraffin embedding. The right lung was snap-frozen in liquid nitrogen and pulverized in a liquid-nitrogen-chilled mortar and pestle. Lung tissue powder was stored at -80 °C until further use. Paraffin-embedded tissue was cut into 4 μm sections and stained with haematoxylin & eosin. For immunostaining, antigens were retrieved by heating the slides for 5 min in 10 mmol/L sodium citrate (pH 6) at 95 °C and cooling to room temperature (RT) in 30 min before blocking endogenous peroxidases with peroxidase block (DAKO, S2001, Enschede, the Netherlands) for 10 min at RT. This step was omitted if antibody binding was visualized with the alkaline phosphatase (AP) system. Sections were blocked with 10% normal goat serum for 30 min, followed by incubation with anti-arginase 1(Amsterdam Liver Center, AMS40.11.13), anti-myeloperoxidase (MPO; DAKO), or anti-murine major basic protein (mMBP; LeeLab, MT14.3.7, Mayo Clinic Scottsdale, AZ, USA) . After washing, sections were incubated with a 1:200 diluted biotinylated rabbit anti-rat secondary antibody (DAKO) for 45 min at RT. Sections were washed, incubated with streptavidin/HRP (Vector) for 30 min at room temperature, and developed with 3,3′-diaminobenzidine (Sigma, Steinheim, Germany) for 10 min. Sections stained for arginase 1 were incubated with an AP-labeled secondary antibody (DAKO) for 45 min, developed with NitroBlue-Tetrazolium and 5-Bromo-4-Chloro-3-Indolyl phosphate (Roche, Almere, The Netherlands) dissolved in 50 mmol/L MgSO4, 100 mmol/L Tris·HCl (pH 9.5) for 30 min, and cover-slipped with an aqueous mounting medium (DAKO). Whole-lung tissue sections stained with H&E, or the MBP and MPO antisera were scored independently by two persons at 10X magnification. Scores were: 0: < 5 inflammatory cells per field; 1: 5–25 inflammatory cells per field; 2: 25–50 inflammatory cells per field; 3: > 50 inflammatory cells per field. Lung tissue powder was homogenized in PBS, pH 7.6, in the presence of a proteinase inhibitor cocktail (Roche, Complete). Cytokines (IL-4, IL-10, and IL-13) were quantified using a Luminex® xMAP® multiplex platform, combined with a customized Milliplex™ mouse chemokine/cytokine panel (Merck, Amsterdam, the Netherlands). Lung tissue powder was homogenized in Tri reagent (Sigma) with the Mini Bead-Beater (Biospec products, Bartlesville, OK, USA). To remove genomic DNA, RNA was precipitated with 2 mol/L LiCl for at least 30 min at -20 °C. RNA integrity was checked by denaturing gel electrophoresis. RNA concentration was determined with a NanoDrop-ND-1000 spectrophotometer at 260 nm (Isogen Life Sciences, Wilmington, DE, USA). 400 ng of total RNA was transcribed using the Roche first-strand synthesis kit (Roche). Quantitative PCR was performed in the Lightcycler 480 (Roche), using the Lightcycler 480® SYBRgreen mastermix (Roche) and the following settings: denaturation 30 s at 95 °C; annealing 30 s at 60 °C; elongation 30 s at 72 °C; 45 cycles; and a final elongation step for 5 min at 72 °C. If reverse transcriptase was omitted, no product was formed. Primary fluorescent data were exported and analyzed with the Lin-Reg Analysis program . mRNA abundance was expressed relative to 18S rRNA abundance. Primer sequences are given in Additional file 2: Table S1. Lung tissue powder was homogenized in RIPA buffer: 25 mmol/L Tris·HCl,pH 7.6, 150 mmol/L NaCl, 1% NP-40, 1% Na-deoxycholate, 0.1% SDS, containing Complete® cocktail (Roche). Protein concentration was measured with the bicinchoninic-acid assay (Pierce, Rockford, IL, USA). 25 μg protein was separated on an SDS-polyacrylamide gel, transferred onto 0.45 μm nitrocellulose membranes, using a wet transfer system (Biorad, Hercules, CA, USA), stained with Ponceau S to confirm equal loading of lanes, washed with TBS (50 mmol/L Tris, 150 mmol/L NaCl, pH 7.6) and blocked with 5% skimmed milk in TBS/ 0.5% Tween-2. Arginase 1 was visualized with rabbit anti-arginase 1 antibody (1:200), followed by an HRP-conjugated swine anti-rabbit secondary antibody (DAKO). The signal was developed using the Super Signal West Pico Substrate (Pierce) and quantified with the Fuji systems darkbox (Fuji Film Life Sciences, Tokyo, Japan). Comparison of groups was performed using the Kruskal-Wallis test for PBS/OVA- versus OVA/OVA-treated, and F/A2 wt/wt versus F/A2 tg/tg mice. Only when this nonparametric test indicated a difference between experimental groups, a multiple comparison of the groups was carried out. Values were considered statistically significant if P < 0.05, and as indicating a trend if P < 0.1. The bivariate, two-tailed Spearman correlation coefficients between each of the lung-function parameters, mRNA and protein concentrations, histology scores and plasma amino-acid concentrations were determined after combining the data from the comparable PBS/OVA and OVA/OVA groups. 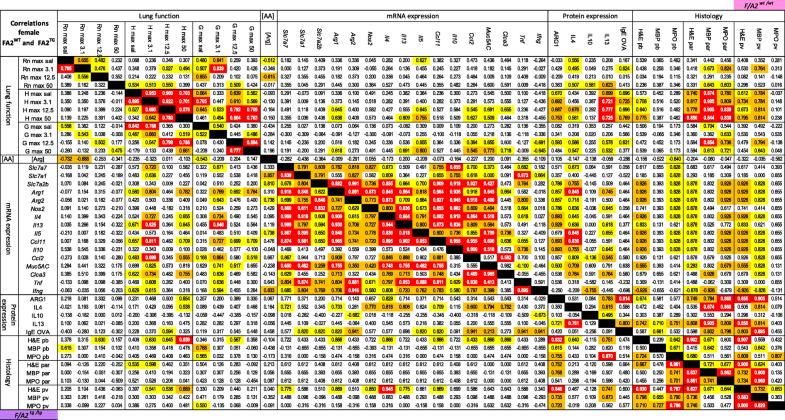 In the Tables, P-values of the resulting correlation coefficients were color-coded, with red indicating P < 0.001, orange 0.01 > P > 0.001, and yellow 0.05 > P > 0.01. 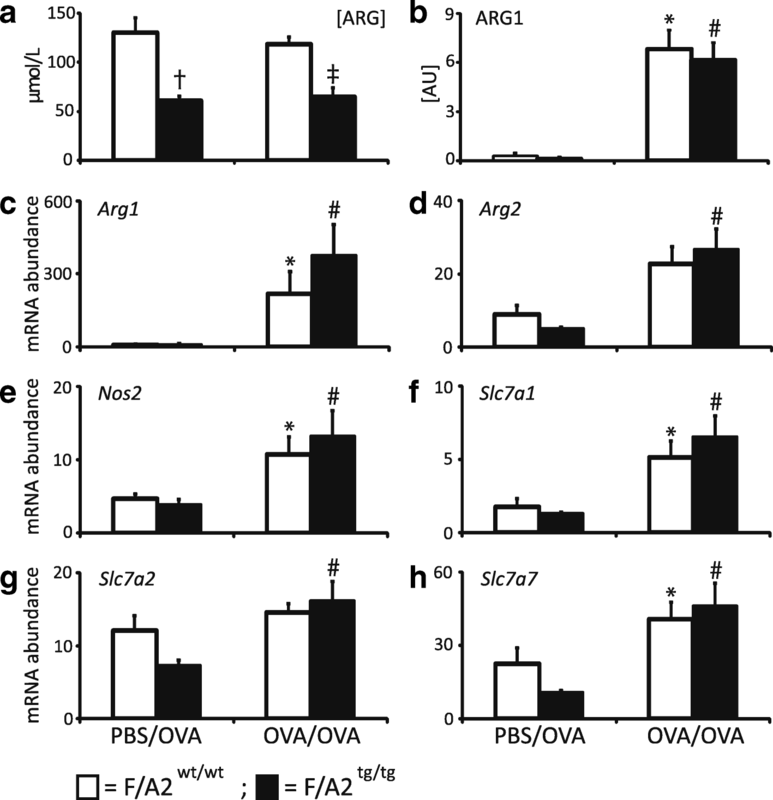 Overexpression of arginase 1 in the enterocytes of the small intestine decreases plasma arginine concentration, in particular in female mice (Figs. 1 and 2). In male F/A2 tg/tg mice, plasma arginine concentration was ~ 90 μmol/mL and in female F/A2 tg/tg mice ~ 63 μmol/mL, or ~ 70% and ~ 50% of their wild-type male and female littermates, respectively (Fig. 1). Because of their more pronounced hypoargininemia we confined our study to female mice. Treatment of female control (F/A2 wt/wt ) and transgenic (F/A2 tg/tg ) mice with the PBS/OVA or the OVA/OVA protocol did not affect plasma arginine concentration significantly (Fig. 2a). Since plasma concentrations of all other amino acids did not change between conditions or genotypes (Additional file 2: Table S2), arginine bioavailability indices such as [Arg]/([Orn] + [Lys]) (competition for CAT transporters) and [Arg]/([Orn] + [Cit]) (intracellular metabolism of arginine) declined correspondingly. Induction of experimental asthma increased arginase 1 expression in lungs dramatically (Fig. 2b), as observed previously [11–13]. We next investigated whether hypoargininemia was associated with adaptive changes in the expression of arginine-metabolizing enzymes or arginine transporters in the lung under allergically inflamed conditions. 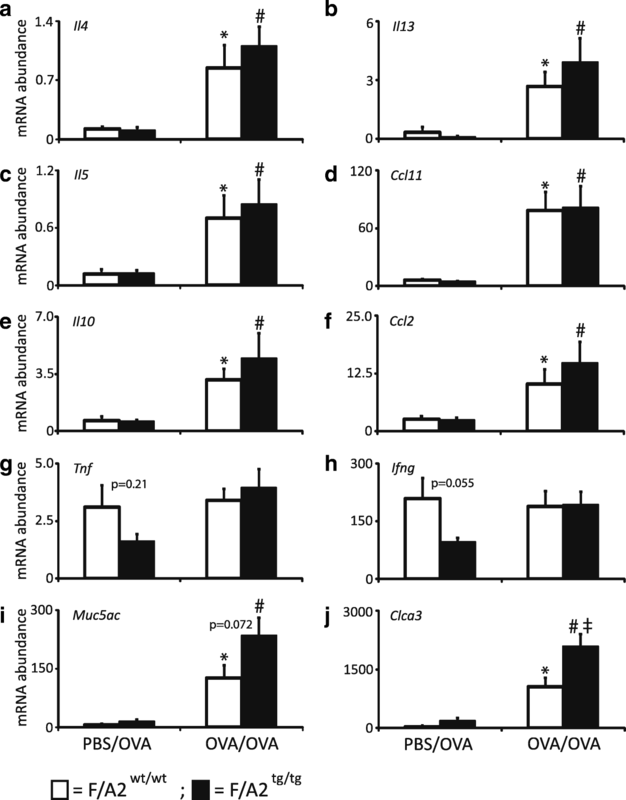 The pulmonary mRNA abundance of the arginine-metabolizing enzymes Arg1, Arg2, Nos2 (Fig. 2c-e), and the arginine transporters Slc7a1, Slc7a2 and Slc7a7 (Fig. 2f-h) did not differ significantly between F/A2 tg/tg and F/A2 wt/wt mice under control conditions (PBS/OVA protocol) All mRNAs increased in both F/A2 wt/wt and F/A2 tg/tg mice when exposed to the OVA/OVA protocol (Fig. 2), but the increase did not reach significance for Arg2 and Slc7a2 in F/A2 wt/wt mice. 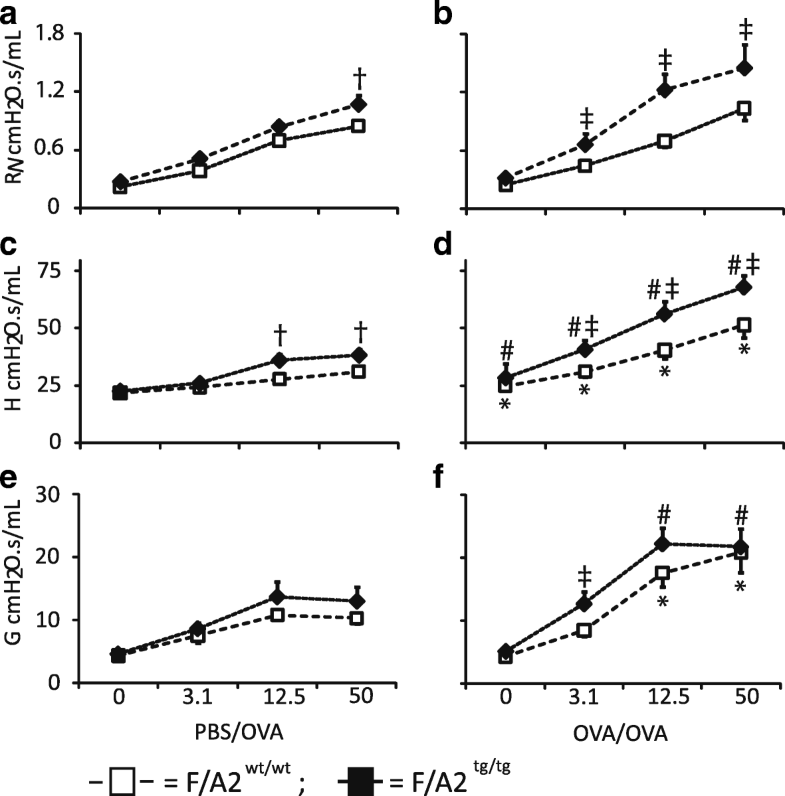 To answer the question whether hypoargininemia has an effect on respiratory mechanics, we measured lung function in PBS/OVA- and OVA/OVA-treated F/A2 tg/tg and F/A2 wt/wt mice. Airway resistance (RN) in response to methacholine-challenges did not differ between PBS/OVA and OVA/OVA-treated wild-type mice (Fig. 3a, b), but was significantly higher in F/A2 tg/tg mice undergoing OVA/OVA treatment (Fig. 3b). Interestingly, a significantly higher RN) was already detected in PBS/OVA-treated F/A2 tg/tg mice challenged with 50 mg/mL of aerosolized methacholine when compared to PBS/OVA-treated F/A2 wt/wt mice (Fig. 3a). Both wild-type and transgenic mice showed significantly increased tissue elastance (H) (Fig. 3c, d) and resistance (G; Fig. 3e, f) when treated with the OVA/OVA protocol and challenged with methacholine. The increase of tissue elastance in response to methacholine was significantly higher in transgenic compared to wild-type mice (Fig. 3c, d), with the transgenic mice already showing an increased response to higher concentrations of methacholine on the PBS/OVA protocol. Transgenic mice were more sensitive to methacholine in terms of tissue resistance (P = 0.0004 at 3.1 mg/mL methacholine; P = 0.0001 at 12.5 mg/ml methacholine) under the OVA/OVA protocol. Tissue resistance did not differ between genotypes under control conditions (PBS/OVA). In aggregate, these data show that hypoargininemia increased all aspects of airway responsiveness measured with the flexiVent™ in mice with allergic asthma. We next investigated whether hypoargininemia affected the gene expression of asthma-associated cytokines (Fig. 4). Allergen sensitization and challenge (OVA/OVA) resulted in an increase in the abundance of Il4, Il5, Il13, Ccl2, Ccl11, and Il10 mRNAs in both F/A2 tg/tg and F/A2 wt/wt mice. Furthermore, the expression of the respiratory epithelium-specific Muc5ac and Clca3 genes was significantly increased, whereas the expression of Tnfa and Ifng remained unchanged. Clca3 mRNA expression was significantly increased in OVA/OVA-treated F/A2 tg/tg compared to their wild-type counter parts. To investigate whether hypoargininemia had an effect on the protein concentration of pulmonary cytokines that are involved in allergic airway inflammation, we performed ELISAs for IL-4, IL-10, and IL-13 in protein extracts of whole-lung homogenates (Fig. 5). 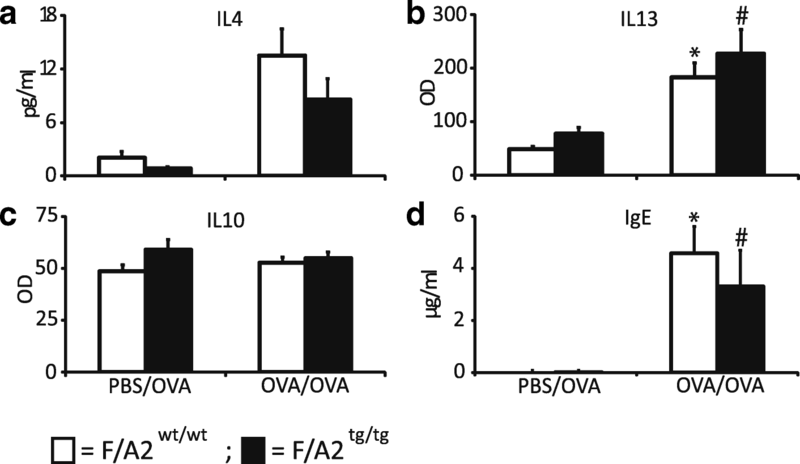 Both IL-4 (trend p = 0.057) and IL-13 were induced by the OVA/OVA treatment to a similar extent in F/A2 tg/tg and F/A2 wt/wt mice, whereas IL-10 was not affected by the OVA/OVA treatment in both groups. OVA-specific IgE production was increased to a similar extent upon OVA/OVA treatment in both F/A2 tg/tg and F/A2 wt/wt mice. We investigated whether hypoargininemia modified the allergic asthma-induced inflammatory response in lung tissue (Fig. 6). H&E-stained sections revealed no inflammatory cells in the lungs of PBS/OVA-treated mice (Fig. 6a). This finding was confirmed by staining sections of the same lungs for the presence of major basic protein (mMBP) and myeloperoxidase (MPO), eosinophil and neutrophil markers, respectively. As expected, inflammatory cells were abundant in the lungs of OVA/OVA-treated mice, but there was no difference between F/A2 tg/tg and F/A2 wt/wt mice. Semi-quantitative scoring of the sections for inflammatory cell density in the peribronchiolar, parenchymal and perivenous areas did not reveal differences between OVA/OVA-treated F/A2 tg/tg mice and their wild-type littermates (Fig. 6b). To answer the question whether circulating L-arginine concentrations changed the overall adaptive response to asthma, we determined the correlation coefficients between AHR parameters, mRNA and protein levels, histology scores and L-arginine concentrations in F/A2 tg/tg mice and their F/A2 wt/wt littermates (Fig. 7). The presence of 3 major blocs (lung function, mRNA expression, and lung histology) with high correlations between parameters in the response to OVA/OVA within a bloc and fewer significant correlations between the blocs is striking. mRNA concentrations in particular hardly correlated with function or histology. Furthermore, more significant correlations were seen in F/A2 wt/wt (wild-type FVB mice) than in F/A2 tg/tg mice, suggesting that arginine availability played a role in these responses. In more detail, we observed that significant correlations between the responses of lung function or lung histology parameters to OVA/OVA treatment were more frequently seen in F/A2 wt/wt than in F/A2 tg/tg mice. In contrast, the responses in mRNA expression to OVA/OVA treatment were similar in both types of mice, with the notable exception of the expression of Il10 (no correlation with other mRNAs in F/A2 tg/tg ) and Tnf and Ifng (stronger correlations). Plasma arginine concentrations correlated inversely with large airway resistance. In aggregate, these data show that hypoargininemia disturbed the coordinated asthma response. The finding that tissue inflammation did not correlate well with lung function parameters in F/A2 tg/tg mice indicates that these events do not share a common regulatory path in this mouse model of asthma . In this study, we investigated the symptoms of allergic asthma in hypoargininemic F/A2 tg/tg mice . The decrease of the circulating arginine concentration as a result of arginase 1 overexpression in the enterocytes was most profound in female mice. OVA/OVA treatment did not change the plasma arginine concentration in either F/A2 tg/tg or F/A2 wt/wt mice, nor did it affect sensitization to OVA, as demonstrated by similar increases of OVA-specific IgE in both genotypes. Airway resistance and tissue elastance were markedly increased in OVA/OVA-treated F/A2 tg/tg mice compared to similarly treated F/A2 wt/wt mice, while tissue resistance in F/A2 tg/tg mice was more sensitive to methacholine than that of similarly treated F/A2 wt/wt mice. Remarkably, the increased airway resistance and tissue elastance were already evident in PBS/OVA-treated F/A2 tg/tg mice at high concentrations of methacholine. The abundance of arginine-transporting and -metabolizing mRNAs and that of inflammatory markers increased to an equal extent in both genotypes after OVA/OVA treatment. The only observed difference was a larger increase in mRNA abundance of Clca3 and Muc5ac (trend, p = 0.072) in F/A2 tg/tg mice. Clca3 and Muc5ac are involved in mucus production and expressed by lung goblet cells. The findings show that the circulating concentration of arginine has a pronounced effect of airway biomechanics, but not on inflammation. In adult mice, overexpression of arginase 1 in enterocytes makes these cells an efficient arginine sink. Compared to F/A2 wt/wt mice, arginine concentration in plasma of F/A2 tg/tg mice dropped by ~ 25% (from 126 μmol/mL to 90 μmol/mL), and ~ 50% (from 124 μmol/mL to 63 μmol/mL) in male and female F/A2 tg/tg mice, respectively. Please note that we reported earlier that males were more affected than females , but that subsequent studies, including the present (Fig. 1), revealed that this conclusion was due to mislabeled blood samples. Elimination of Arg1 expression in macrophages has been accomplished by bone-marrow transfer from 9 to 12-day old Arg1-deficient pups to congenic recipient mice  or by Tie2Cre-mediated deletion of floxed Arg1 alleles in hematopoietic tissues [11, 12, 18]. Allergic airway inflammation was induced by sensitizing such mice to ovalbumin, Aspergillus, or Schistosoma eggs. Furthermore, these tests were not only carried out in TH1-prone C57BL/6, but also in TH2-prone BALB/c mice. Despite this very broad approach, these studies found no effects of Arg1 deficiency in macrophages on allergic inflammatory responses or function tests of the lungs. The present study reports that a ~ 50% decrease in plasma arginine concentration also did not affect the expression of inflammation-associated genes or the histopathology in the lungs in response to OVA/OVA treatment, even though this low ambient arginine concentration causes a clear phenotype  due to the induction of the endoplasmic reticulum-stress response . OVA/OVA treatment affected the expression of arginine-transporting and -metabolizing genes in Arg1-deficient mice [11, 12], but not in F/A2 tg/tg mice. This finding suggests that quantitively arginine metabolism in the lungs is largely confined to macrophages. In agreement, it was earlier reported that local arginine deficiency suppresses T-cell activation and thus limits the inflammatory response . Interestingly, it was also reported that a high oral dose of L-arginine reduces airway inflammation, and TH2 cytokine and mucus production in a mouse model of asthma . Absence of ARG1 from macrophages did not affect the ventilatory function of allergically inflamed lungs in the studies of Niese  and Barron . 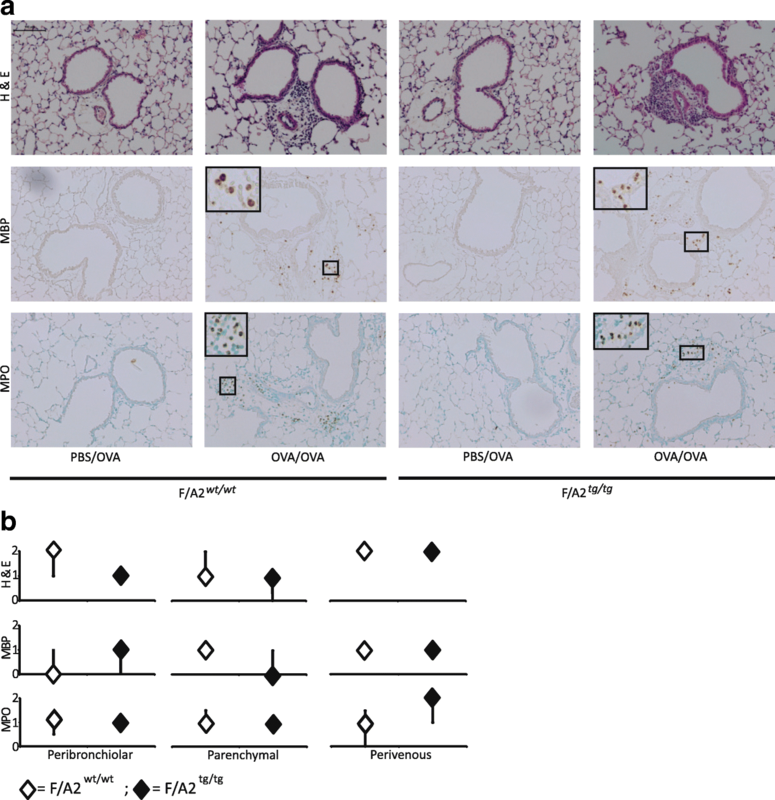 Peripheral lung function was slightly better protected in Arg1-deficient OVA/OVA-treated male C57BL/6 mice than in their wild-type littermates , but this protective effect of Arg1 deficiency in macrophages was not found in female mice . The present study shows that a ~ 50% reduction of plasma arginine concentration increases airway resistance and tissue elastance, and the sensitivity of tissue resistance to methacholine treatment in OVA/OVA-treated F/A2 tg/tg mice. Moreover, some of these effects were already seen in PBS/OVA-treated F/A2 tg/tg mice, albeit to a lesser extent. The pronounced effect of hypoargininemia on lung function is remarkable, because it apparently exerts its effect outside the macrophages. These macrophages accumulate in the peribronchiolar space of asthmatic lungs, that is, close to the smooth muscle cells of the airways (see Fig. 6) and express high levels of arginase . The ambient concentration of arginine had a large effect on the contraction of perfused guinea-pig tracheal rings ex vivo  and a high oral dose of L-arginine reduced AHR in mice in vivo . Apparently, the elimination of arginase 1 expression from the peribronchial macrophages does not result in a sufficiently high local increase in arginine concentration to reduce airway resistance or mucus production. The finding that a decrease in plasma arginine concentration does aggravate the symptoms of allergic asthma suggests that a limitation of systemic L-arginine availability impairs relaxation in airway smooth muscle cells. One reason for the sensitivity of lung mechanics to circulating rather than local arginine concentration may be the very strong perfusion of the lung and, hence, buffering effect of plasma arginine. It seems reasonable to mechanistically ascribe the dependence of lung function on circulating arginine to arginine availability for NO production. Genetic elimination of the NOS2 enzyme has been demonstrated to aggravate AHR in OVA/OVA-treated mice and resulted in a ~ 2-fold reduction of the exhaled NO concentration [8, 10, 31]. NOS1-KO mice recruit fewer eosinophils (~ 70% of wild-type) and produce less NO (~ 10% of wild-type) in a mouse model of OVA-induced asthma, and upregulation of NOS2 is abolished . NOS3-KO mice are inherently hyperresponsive to inhaled methacholine . The demonstration that NOS2 produces peroxynitrite in allergic asthma  indicates that NOS2 already tends to produce superoxide rather than nitric oxide under this condition . Superoxide production by NOS is a marker for cellular arginine or BH4 deficiency  and may well explain why a high oral dose of L-arginine reduced the production of markers of nitro-oxidative stress, such as nitrotyrosine . In aggregate, the findings in Nos-deficient mice show that NO plays a prominent if not determining role in AHR and underscore our hypothesis that hypoargininemia aggravates AHR in severe allergic asthma via a decrease in NO production. These experimental findings confirm the earlier clinical observation that L-arginine availability is related to airflow obstruction in severe asthma . The experimental model we used to base our conclusion on is a transgenic model. The disadvantage of transgenic models is that the life-long exposure to in this case hypoargininemia may have additional features that could affect the response to allergic asthma. The physiologically most attractive option to assess such a potential confounder would be to supplement F/A2 tg/tg mice with arginine. When we carried out this experiment by treating mice twice daily for 5 days with 5 mmol/kg arginine and measuring plasma arginine concentration 6 h after the last injection , circulating arginine concentration in wild-type mice increased > 2-fold, but the intervention was without any effect in F/A2 tg/tg mice. Since circulating arginine concentrations vary directly with transgenic arginase activity in the small intestine of F/A2 tg/tg mice , the high turnover of plasma arginine in F/A2 tg/tg mice apparently neutralizes the supplemented arginine. An alternative option would be to infuse arginase intravenously into wild-type mice. This intervention is very effective in lowering circulating arginine concentrations, but also short-lived , so that it could not be used in the present setting. A third approach could have been treatment of F/A2 tg/tg mice with a well-established arginase inhibitor such as nor-NOHA. However, nor-NOHA is an arginine analogue which requires ~ 10-fold higher concentration to inhibit intracellular than dissolved arginase , suggesting it has to compete with arginine-like molecules for membrane transport. Probably more seriously, its Ki for mouse macrophage arginase is 50 μmol/L, that is, similar to circulating arginine concentrations in F/A2 tg/tg mice. These considerations show that the F/A2 tg/tg mouse model was instrumental in revealing a potential requirement for circulating arginine in severe allergic asthma, but that additional studies are necessary to reaffirm this function. Reduction of circulating arginine levels by ~ 50% in a mouse model of OVA-induced asthma leads to an increase in AHR as shown by the increases in RN, H, and G, without altering the inflammatory response or the expression of arginine-metabolizing or transporting enzymes in the lung. Ablation of arginase 1 in macrophages, on the other hand did not result in an improvement of any of the lung function parameters. We conclude that the reduction of circulating L-arginine levels rather than a macrophage-mediated increase in arginine catabolism worsens AHR. solute carrier family 7 members1, 2 or 7 resp. This study was supported by a grant from the Transnational University Limburg. All data generated or analyzed during this study are included in this published article (and its Additional files 1 and 2). RHEC performed the experiments, made substantial contributions to the analysis and interpretation of data and wrote the initial draft of the manuscript; MEP participated in the acquisition of data and the revision of the manuscript; ET participated in the acquisition of data and provided technical support; WHL and SEK conceived of the study and contributed substantially to the interpretation of data and the revision of the manuscript. All authors read and approved the final manuscript. All animal experiments were reviewed and approved by the committee for animal care and use of Maastricht University (DEC2005–146).